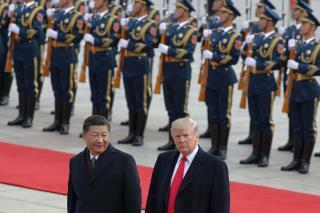 (Newser) – President Trump said Sunday he will extend a deadline to escalate tariffs on Chinese imports, citing "substantial progress" in weekend talks between the two countries, the AP reports. Trump tweeted that there had been "productive talks" on some of the difficult issues dividing the US and China, adding that "I will be delaying the US increase in tariffs now scheduled for March 1." Trump said that if negotiations progress, he will meet with Chinese President Xi Jinping at Mar-a-Lago to finalize an agreement. US and Chinese negotiators met through the weekend as they seek to resolve a trade war that's rattled financial markets. Meanwhile, the Canadians aren't ready to ratify Trump's "new deal"! Hooray, hooray for our President Trump. He has the courage and commitment to the betterment of our country to actually stand up for our country. What is it that you Libtards think is so damn wonderful about China ? The definition of a Libtard is an individual, whose thinking process has been rendered impaired by political correctness. In other words, His Flatulence can't get the Chinese to budge. Next week he'll say that there was never a deadline and any talk of it is fake news. The big-boned gal who does all the lying will say "I won't dignify that question with an answer" when asked about it.